This annual surge of snowmelt and rainwater gathers force from surrounding hillsides and concentrates it into a torrent of eye-catching contrasts. Dark water plunges over a ledge and billows up as sparkling, white foam. A pushy downstream flow reverses suddenly into an eddy. Whirlpools appear and disappear among pulsing boils. Although the spring freshet subsides in a matter of days, the restless energy of high water is captured in Northeastern river names that have endured for centuries. Those originating from Eastern Algonquian languages include Sacandaga (“overflowed lands”), Ottauquechee (“swift mountain stream”), Pemigewasset (“where side current is”), and Machias “(bad little falls”). Every April, these rivers attract kayakers and canoeists who want to experience the season’s turbulent power. Meanwhile, a more tranquil force stirs in the headwaters: the awakening of turtles. One by one, they rouse from hibernation and surface from the mucky bottoms of ponds, wetlands, and slow-moving streams. Some will mosey out of moss hummocks or even muskrat burrows, where winter hiding carries the risk of detection and predation by their hosts. One herpetologist who searched burrow complexes in New Jersey found twelve wood turtles holed up with five spotted turtles. 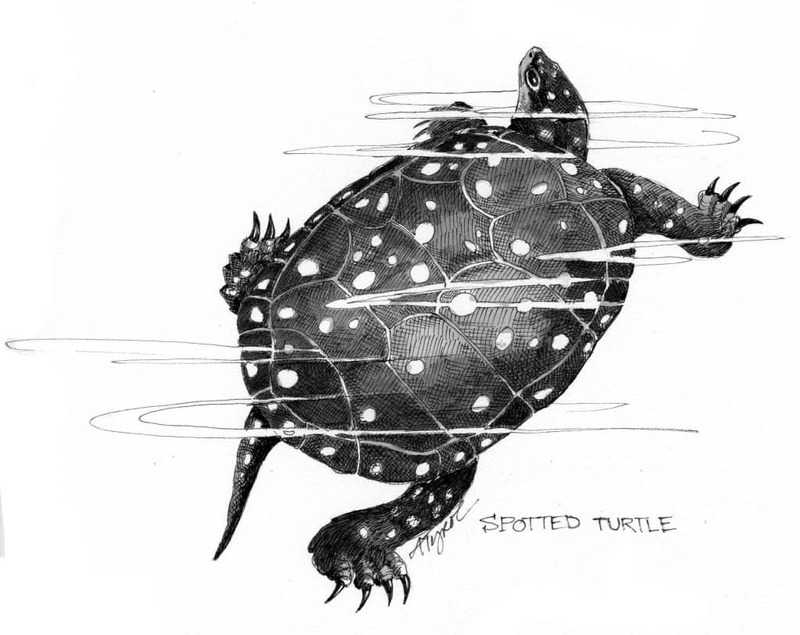 Spotteds, which may loaf about in shallow water during winter warm spells, perk up to peak activity in April and May. During this period, they restore their depleted reserves on a diet of aquatic plants, invertebrates, tadpoles, and fish. Between feeding bouts, they may move unhurriedly among a variety of wet and dry habitats or break into frenetic courtship chases that end, after fifteen to thirty minutes, in mating. Habitually frenetic northern short-tailed shrews are also breeding in wetlands and damp woods at this time of year. Active day and night, they tunnel under moist soil and leaves and consume up to three times their mass every day, fueled by caches of food scattered throughout their territories. Only seven of the world’s 385 shrew species are known to cache prey and the northern short-tailed shrew is the most accomplished hoarder in this group. Up to 90 percent of its captures are stored in collections that can include most any ground-dwelling animal of smaller or comparable size: frequently snails, worms, and insects, but also salamanders, voles, and the occasional bird. Scatter-hoarding is an effective hedge against fluctuations in food supply. The added food security eases the strain of reproduction on females, who reach sexual maturity when just seven weeks old and can raise three to four litters per year. The stamina of these solo parents is evident in their mating behavior, which involves up to 20 copulations a day for two to three days. In most instances, the female carries on with her other activities while dragging the male behind her. It’s not necessary to root around in shrew tunnels to find a species that uses storage and scattering strategies to improve its breeding prospects. The eastern newt provides a more visible example on the margins of spring ponds. But rather than store food, females in some northern populations of this species store sperm collected during autumn mating. Several months later, their eggs are fertilized as they pass from ovaries through an oviduct to be deposited one-by-one around their home ranges. The timing of egg-laying and spring mating depends on climatic variations, but both are underway throughout the Northeast by April. During oviposition, a female attaches her sticky egg to the stem or leaf of a live or decaying aquatic plant. She may clasp the leaf with her hind legs and then fold it, soft taco-style, around the egg, creating a package of future possibility. From the soggy edge of a pond, the underwater forest of algae-slimed weeds doesn’t jump out as a place of wonder. But some of this month’s marvels are like that — obscured by shadow and mud, but no less fresh than the freshet, itself. Dan Lambert is a wildlife biologist and the assistant director of the Center for Northern Woodlands Education. He lives in Hartland, Vt. The illustration for this column was drawn by Adelaide Tyrol. The Outside Story is assigned and edited by Northern Woodlands magazine, www.northernwoodlands.org, and sponsored by the Wellborn Ecology Fund of New Hampshire Charitable Foundation: wellborn@nhcf.org.